"On the ground floor of a terraced house for rent nice apartment in Numana, 150 mt. From the sea and close to the center. The apartment is surrounded on three sides by a garden of about 80 square meters. Overlooked by two large covered porches, where you can stay and meals outdoors. placed in the garden is a barbecue where you can cook fabulous barbecues can be enjoyed quietly in the shadow of the two porches. The apartment is composed of kitchen-living room, bedroom, bedroom with bunk beds, bathroom with shower. 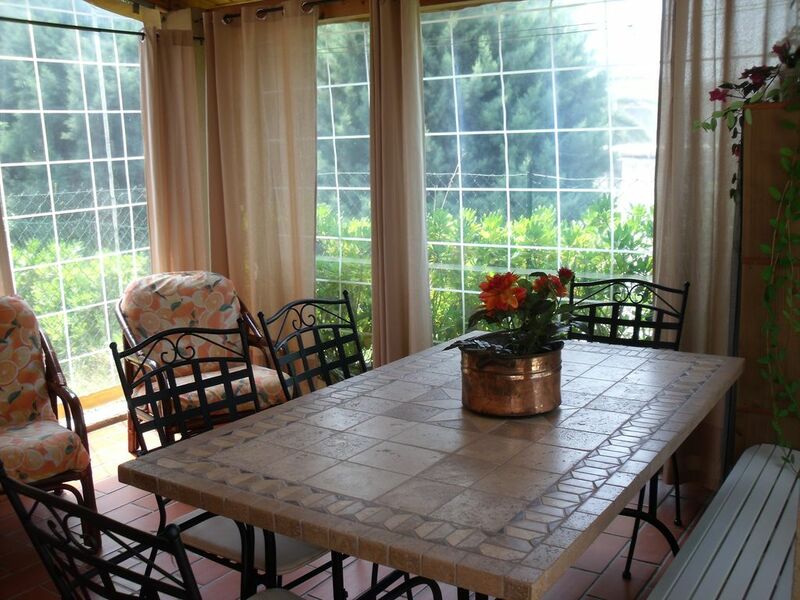 Fully furnished, equipped with appliances, independent heating gas, doors scomparsa.Nonostante is located in the central area of the country, the accommodation enjoys a very quiet and relaxing as located within a small residences surrounded by trees and green areas. takes five minutes to walk to the beaches equipped and free, while the sports bike lovers, a few meters you will reach the bike path that crosses the country and continues throughout the litoranea.La house has a parking space in the car park in front of the house.L 'accommodation for its position is functional for all types of holiday, not just summer. well suited for a stay that will allow guests to enjoy the beauties of this land rich in history, food and wine tours quality (Verdicchio, Rosso Piceno, Rosso Conero, the oil routes) and unique landscapes and enchanting. " To booking you must pay a deposit of 25% while the final payment must be made as follows: 1)	payment in cash on the day of arrival; 2)	Bank transfer payment and credit card payment: 10 days prior to arrival . The day of check in; the owner give you the keys. Inside the Conero Regional Park , 150 mt. from the sea is set "il nido d'amare", a charming holiday home, which reminds the colors and the essence of the sea, in its particular style, making it a cozy and relaxing place, offering at the same time, all the facilities and comforts.Those who choose" Il nido d'amare", choose to pass not just a holiday, but also an experience to remember in the beautiful setting of the Conero Park , where are well mixed the unspoiled nature of the woods and the sea, and the vitality of the towns of Numana , Sirolo and Porto Recanati, animated by the many clubs and shops.Not to be forgotten is the nearby Loreto, the destination visited by many pilgrims thank to the presence of the sanctuary dedicated to the Virgin Mary, where according to the legend, lies her native house. Il “Nido d’amare” is surrounded on three sides by a garden of 80 square meters, where guests can spend relaxing time, reading a good book, drinking a tasty drink , or eat cooking grilled meat or fish on the barbecue.Upon your arrival we will be pleased to offer you a little welcome gift Thank you for choosing to spend your holidays in our holiday home! FURNISHED WITH CARE AND PERSONALITY 'DOWN TO THE MORE' SMALL DETAILS, VERY QUIET AND RELAXING, SUITABLE FOR COUPLES, FAMILIES, GARDEN AND PARKING PRIVATE PROPERTY 'EXCLUSIVE CASA.NON USED CAR TO GO TO SEA OR GO SHOPPING OR A WALK THE SEA, THE CENTER OF THE COUNTRY ARE A FEW METERS. Thank you so much for renting out this very pretty house by the sea! It had everything we needed and the garden is like a Paradise. Very relexing, quiet and comfortable and still just a few steps from the beach. I'm glad that you enjoyed it and I hope you're still come back here to spend a other holiday! Thank you so much for renting out your beautiful house. We found it very pretty and the garden is like paradise with all the flowers. It is very relaxing, quiet and comfortable and still just a few steps from the sea. We couldn´t wish for a better place in Marcelli di Numana. Wish you Ivana and Rafaello all the best. we are glad that you enjoyed it and hope to have you with us soon for the next holiday in Italy. La villetta ha un bel giardino e due verande dove si puo' stare comodamente. L'attrezzatura per la casa è completa: non manca niente per un soggiorno confortevole. Il mare è vicinissimo, 5 minuti a piedi. I padroni di casa sono stati molto gentili e disponibili. Abbiamo passato una vacanza rilassante e molto piacevole. L'appartamento è stato davvero una bella sorpresa. Molto pulito e curato nei particolari è diventato il luogo ideale per rendere la nostra vacanza di 6 giorni piacevole e rilassante. La posizione è davvero strategica, a pochi minuti a piedi dal mare e da tutte le comodità (supermercati, spiagge libere ed attrezzate, ristoranti, gastronomie, bar ed edicola ). Un giardino grande e due bellissime verande dove pranzare e cenare sempre all'aperto. Pur essendo dotato di aria condizionata non l'abbiamo mai usata perchè l'ambiente interno era molto arieggiato anche nelle giornate più calde. Nonostante al piano superiore fossero presenti altri inquilini l'appartamento è risultato molto insonorizzato. Molto comoda la doccia calda all'esterno e la bicicletta per i piccoli acquisti. Con due bambine piccole ho trovato poi estremamente utile la presenza della lavatrice e della lavastoviglie. Altro lato positivo da segnalare è il fatto che l'appartamento è situato all'interno di un contesto privato silenzioso e lontano dal passaggio delle auto, con posto auto interno a noi riservato. I proprietari sono stati estremamente gentili e disponibili e assolutamente mai invadenti. Lo consiglio vivamente! Wij vonden het huis aan de binnenkant vrij klein, de tuin is prima. Wat prijs/kwaliteitsverhouding betreft: voor het gebodene was het aan de prijzige kant. Verder hebben wij een heerlijke week gehad! To cover the S.S. 16 Adriatic, the shunting lines are found from Km 314 to Km 320. We are at the "center of Italy, the Adriatic and the Marches, strategic location as it offers the advantage of using the many tourist offers, all concentrated in a few km. Away. We are in the Riviera del Conero where the beaches of the Bay of Portonovo, Sirolo and Numana (blue flag of Europe), Marcelli will welcome you with their beautiful landscapes where the sea blends with the white stone and the green woods of Monte Conero. Conero in the park you can hike (also guided ) walking, mountain biking, horseback riding and for those who want to push over an hour by car, you can reach the mountains Sibillinie / or Frasassi. lovers of art and culture suggest you visit the villages medieval Offagna, Recanati, Osimo, Filottrano, Tracks, Camerata Picena, Polverigi.Gli theater and opera fans can enjoy magical evenings Arena Sferisterio or at the Theatre "At Cave Sirolo." from the Sanctuary of Loreto , famous for the home of Santa Maria di Nazaret.Per shopping a few kilometers away there are the outlets of the most popular brands. Le chiavi vi saranno consegnate dal proprietario. Possibilità di noleggiare biancheria da letto e da bagno a pagamento. VERY IMPORTANT:The day of check in; the owner give you the keys.Bed linen and towels are not included in the price of the stay.